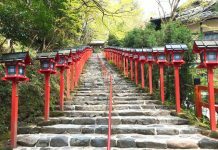 There is a place near Kyoto forgotten by time, a place where nature collides with traditional civilization. In the Arashiyama Bamboo Grove, you will feel as if you were transported to another era. Its quiet setting is the perfect Japanese scenario, and its iconic bamboo trees serve as symbols of wish fulfillment. 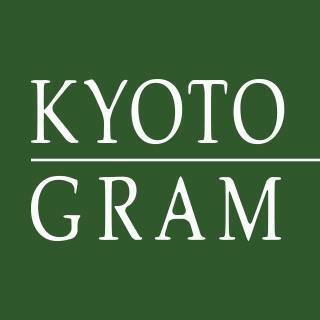 In the Sagano Bamboo Forest in Kyoto lies a grove surrounded by small temples and quiet streets. This bamboo haven is isolated from the city noise all year long, and its trees grow to full height, projecting shadows on the floor and dancing with the gushing of the wind. 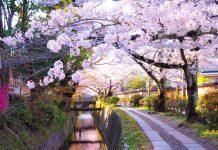 The 500-meter path is located by the Nonomiya Shrine, close to the Tokko Arashiyama Station, it is one of the best places to photograph in Japan, and it’s free to enter! 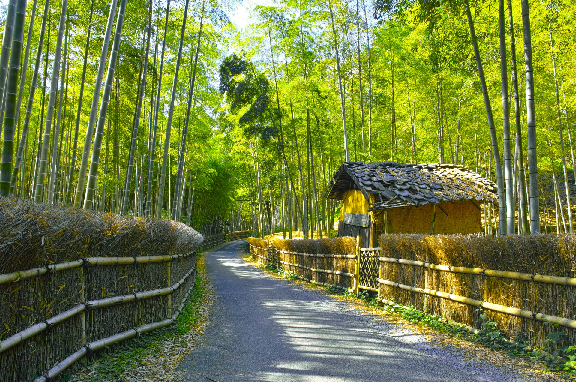 Standing amidst the bamboo path feels like being transported to another era, bonded with nature. 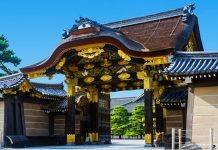 The end of the grove leads to the Okochi-Sanso Villa, a traditional location wth breath-taking gardens. During the Star Festival, the Japanese write their wishes on Tanzaku, which are small, colored pieces of paper, and hang them on bamboo trees in places all over Kyoto, such as the Horikawa Site and the Kamogawa Site. 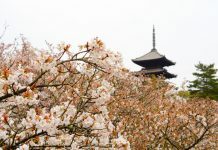 It is said that bamboo trees are the perfect connection between wish wishers and the deities Orihime and Hikoboshi, whose love is celebrated during the Star Festival. Bamboo trees grow tall and straight, and by hanging one’s wish on them, people’s dreams grow with the tree and ascends straight up to the heavens. Some people send the bamboo afloat along with the wish, representing their hopes traveling through the Milky Way. Others, burn them to symbolize their wish ascending to the deities as smoke. However, most wish-wishers rely on the bamboo itself as a channel for their Tanzaku. 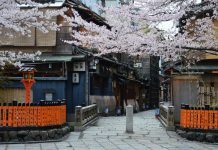 Kyoto is a place where the old ways of living clash with the modern day to day haste, and during the Star Festival, this couldn’t be truer. Amidst the celebration of the yearly encounter of two starts, Kyoto streets are filled with illuminating attractions at night; perhaps the most iconic of these is the “Milky Way of Light” in the Horikawa Site, a representation of the river of stars that separates the two star-crossed lovers. The Tanzaku wish strips are the spirit of the festival, and you can find them in almost every tree you walk along, dancing in the summer wind. The Star Festival in Kyoto, called Kyo no Tanabata, is held every August, matching the 7th day of the 7th month of the Lunar Calendar. Kyoto’s ten-day celebration also features romantic settings, like the Yuzen Nagashi Illumination, in which a representation of the Horikawa River is made of weaving fabrics and candles “floating” on it. The Nijo-Jo, a Shrine within Kyoto, is lit with bamboo lanterns filled with wishes and prayers of locals. There are also numerous expositions and shows of traditional and moderns forms of Japanese art. 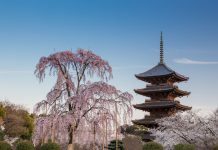 Kyoto’s ten-day Festival is rightfully so, there is so much to see, and so much to do, that even after the ten days are up, most people haven’t seen it all. However, a must-see location all year long is the Arashiyama Bamboo Grove. Its bamboo trees remain the classic icon of righteousness and hope.